One of the products that both the Kinder Morgan and Enbridge pipelines transport is diluted bitumen. Bitumen is a semi-liquid mixture of oil, sand and clay. This initial bitumen is difficult to transport due to its high density, viscosity and adhesive properties. To move bitumen, it is mixed with a diluent like naphtha or other light hydrocarbons. When diluted bitumen is spilled onto a water body, it initially floats and spreads like conventional oil. Overtime, the volatile components in the oil evaporate and pose a possible health and fire hazard. As the spilled oil undergoes weathering, it becomes more viscous and dense. This weathered substance than mix with sediment to form tar balls and sink, making subsequent recovery very difficult. Cleaning up a bitumen spill is a challenge. The oil on the surface of the water can be recovered using mechanical skimmers and booms. Meanwhile commercial chemical dispersants have limited effectiveness when used on diluted bitumen. The best practices for recovering bitumen that sinks underneath the water are still being researched. The Kinder Morgan Trans Mountain pipeline currently transports light and heavy crude oils including diluted bitumen. It began transporting oil from Edmonton, Alberta to Burnaby, British Colombia in 1961. Since it began operations, there have been 82 spills that have been reported to the National Energy Board for the Trans Mountain line. One noteworthy spill occurred on July 24, 2007 at 12:32 pm in the City of Burnaby (Population of 223 220). An excavator bucket which belonged to a contractor struck and punctured the line. The heavy crude oil sprayed into the air for 25 minutes until the pipeline was isolated. About 234 000 L was released, covering local residences and roads and contaminating the surrounding soil. 100 000L of oil seeped into the storm drain system affecting both the Burrard Inlet and to a smaller extent the Kask Creek. 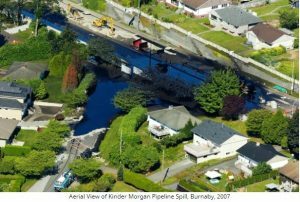 To respond to the 2007 spill in Burnaby, a unified command was set up involving Kinder Morgan Canada, the National Energy Board and BC Ministry of Environment. The RCMP and Burnaby Fire Department secured the area evacuated about 225 residents from their home. Meanwhile, the Western Canada Marine Response Corporation responded to the spill on the Burrard Inlet at 1:24 pm and was booming the area by 2:15 pm. Boomings, skimmers and absorbent pads were all deployed along the rocky shoreline along with a cleaning formula. The contaminated soil was excavated while surrounding homes were re-landscaped and cleaned. While more than half of the residents were able to return the same day, five of the houses were deemed unlivable for four months. Since the spill was deemed an accident, Kinder Morgan and the other two offending parties were fined $1 000 and had to contribute $149 000 to B.C.’s Habitat Conservation Trust Foundation. Kinder Morgan also had to pay $100 000 towards a new education and training program. The Line 3 Pipeline is one of a series of pipelines used by Enbridge to transport crude oil and natural gas. It was constructed in 1967 and currently transports crude oil from Hardisty, Alberta to Superior, Wisconsin. The initial spill was found near Clearbrook, Minnesota (Population of 533) on November 13, 2007 at 7:00 am. About two barrels of crude oil were released due to two pinhole leaks caused by fatigue cracks along the longitudinal seam of the DSAW pipe. The spill was reported to the Minnesota Office of Pipeline Safety Duty Officer at 8:22 am while the line was closed. The contaminated soil was extracted and moved to a disposal site. The second release occurred when Enbridge attempted to replace the damaged pipe. On November 28, 2007 at 3:47 pm when the replacement pipe was being tested, the coupling used for the replacement failed. Oil was emitted as a spray and ignited once it reached a nearby heater being used by the workers. The resulting fire and explosion led to the death of two Enbridge employees and the evacuation of several households. Local police, ambulances, fire departments and the Red Cross responded to the accident and Line 1, 2 & 4 were also shut down within minutes. Since the released oil was contained within a worksite excavation, it was allowed to burn off. However the thick smoke and soot were still a cause for concern. Every pipeline incident is a teachable moment. Companies learn from past incidents to improve safety and operational practices to prevent future incidents. Both Enbridge and Kinder Morgan have made changes to their safety and operational procedures after these spills. Kinder Morgan formed the Pipeline Protection Group who focuses solely on pipeline protection. Enbridge made changes to their pipeline repair and replacement protocols. But it’s important to look back at these past incidents when considering the risk pipelines present. Jerdon Small Phillips is an Engineer-in-Training and graduate from Sheridan College’s Environmental Control program with a B.Sc. in Chemical Engineering from Queen’s University. He is currently volunteering with the WEAO Professional Development and Communications Sub-Committee. He can be reached at Jsphillips990@gmail.com. Brownfield grants from the U.S. Environmental Protection Agency (EPA) are one of many sources of funds that can support redevelopment of contaminated sites. This webinar will highlight a number of redevelopment resources available from the National Park Service (NPS), The Department of Health and Human Services (HHS), and the National Endowment for the Arts (NEA) to leverage your brownfield dollars. The webinar will also feature a presentation from a community that has successfully used grants, loans and other support from these agencies for its revitalization efforts. It is the fourth in OBLR’s webinar series on what communities need to know to successfully leverage resources for brownfields revitalization. The webinar is scheduled for February 28th from 1:00 pm until 2:30 pm EST. To register, visit the webinar registration website. A March for Science is planned in Washington D.C. and around the world on April 22nd, 2017. The marches, organized by scientists to highlight the importance of research, are meant to be a celebration of science as opposed to a protest. The organizers of the March for Science are scientists and science enthusiasts. They claim that we all recognize that science is everywhere and affects everyone. To determine if your community is holding a satellite march, visithttps://www.marchforscience.com/satellite-marches/. The City of Brantford will be hosting the 2017 Inter-Municipality Brownfield Coordinators Conference this coming June in the City of Brantford. The exact date and other details about the conference are pending. The theme of the planned one and a half day conference will be Brownfield Prevention. Included in the event will be a bus tour of brownfield sites and a special brainstorming session on the tools for implementation in in medium-sized cities. The objective the conference will be to develop a working paper about brownfield prevention tools. The conference organizers hope to attract more than 20 municipal leaders in brownfield remediation from across Ontario and beyond. 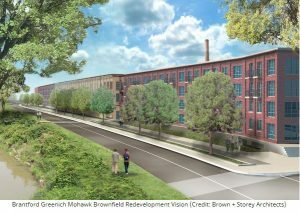 The City of Brantford considers itself a leader on brownfield redevelopment and will showcase work done on two redeveloped areas – the former Greenwich-Mohawk and Sydenham-Pearl industrial sites. The City of Brantford moved to clean up the sites without having a developer waiting in the wings for the remediation to be done. The Sydenham-Pearl site, which has been cleaned up, consists of two properties at 17 and 22 Sydenham St. Crown Electric, which went out of business in 1993, occupied 17 Sydenham. The property, seized by the province for unpaid taxes in 1995, became the site of numerous fires. In 2004, the city stepped in and demolished the building after there were three fires in eight months at the site. The site at 22 Sydenham was home of Domtar, a manufacturer of roofing materials for decades. Northern Globe Building Materials Inc. took over the operation until it went into receivership and closed in 1999. The property became a neighbourhood eyesore and the site of many fires including one in 2001, which forced the city to take action. The city spent $650,000 to level the buildings and clear the site. Greenwich-Mohawk, meanwhile, was once home to some of Brantford’s biggest and best-known factories including Massey, Cockshutt and Sternson. When those companies closed, many of the buildings were abandoned and fell into disrepair. Fires plagued the Greenwich-Mohawk site as well before the city moved in and the buildings were demolished. The site has since been cleaned up in a massive operation that cost close to $15.5 million. DNV GL, a safety and sustainability service firm, and Norddeutsche Reederei H. Schuldt, a shipping company headquartered in Germany, have signed a contract to carry out Inventory of Hazardous Materials (IHM) certifications for the shipping company’s managed fleet of more than 50 vessels. 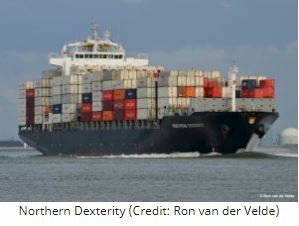 The first vessel to undergo sampling and testing is the 3700 TEU container vessel Northern Dexterity. Once complete, this certification provides independent verification of the vessels’ IHM, as required by the European Ship Recycling Regulation. The sampling and analyses on board Northern Dexterity is being carried out by hazmat specialists from the two independent laboratories exag GmbH Marine Consulting and QSU GmbH, under the supervision of DNV GL. The vessel is scheduled to receive the IHM certificate in February 2017. The project is expected to be completed by early 2018. The IHM is one of the cornerstones of the European Ship Recycling Regulation, according to which every EU-flagged new-build has to carry an inventory of all hazardous materials contained in its structure or equipment with a statement of compliance by 31 December 2018. The IHM is also an important feature of the Hong Kong Convention, which is expected to enter into force in 2020. The European Ship Recycling Regulation, in force since 30 December 2013, addresses the environmental and health issues associated with ship recycling while avoiding unnecessary economic burdens. Applicable to all EU-flagged vessels as well as non-EU-flagged ships calling at or anchoring in ports within the European Union, it accelerates the implementation of the requirements of the Hong Kong Convention and sets out responsibilities for ship owners and recycling facilities both within the EU and in other countries. Of around 60,000 ships around the world, about two thirds are affected by it. The term “brownfield site” means real property, the expansion, redevelopment, or reuse of which may be complicated by the presence or potential presence of a hazardous substance, pollutant, or contaminant. Brownfield properties are vacant or underutilized places where past industrial or commercial activities may have left contamination (chemical pollution) behind. 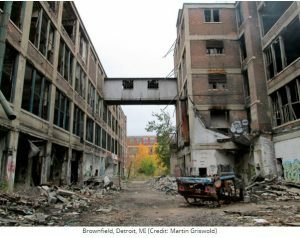 Brownfields can: (1) pose health and safety risks; (2) be costly for the communities where they are located; and (3) be redeveloped to meet health, safety and environmental standards. Based on the definitions above, is the following property described below a brownfield? The subject property contains environmental contamination in the ground due to the operational activities of a previous land use. The soil and groundwater contamination at the property is the result of a former gas station and automobile repair garage in operation between approximately the 1960s and 1990. The extent of the contamination has rendered the property vacant, under-utilized, unsafe, unproductive and abandoned. In 1992, the portion of the property containing the gas station was severed to divide the still operational gas station from the former automobile service garage. The severed off portion of the original property (i.e., the property in question) has not been utilized for any purposes since 1992. The local municipality, recognizing contamination was evident at the subject property, subsequently required that a Record of Site Condition (RSC) be completed prior to the draft approved development occurring at this location. A RSC a technical document that summarizes the environmental condition of a property, based on the completion of environmental site assessments. A signed Development Agreement requested by the Municipality stipulates this requirement be completed prior to proceeding. In addition, the Municipality placed a “Holding” Zone designation on the property in its Zoning By-law prohibiting development until a RSC is provided. A toxicologist reviewed the soil and groundwater concentrations present at the subject property and determined that human health risks may be present as result of the subsurface contamination and the subject property may therefore be considered ‘unsafe’. Although some remediation was performed, contamination from an off-site source prevented total and complete clean-up and the ability to state the property was clean to the applicable clean-up standard. As such, a site specific risk assessment (SSRA) was performed at considerable cost. The SSRA was eventually approved by the MOECC. The clean-up (Phase III ESA) report and SSRA were used to support the RSC. The municipality was of the view that the property was not a brownfield because the subsurface area impacted by contamination represents only 5 percent of the property. Based on this percentage, the municipality stated there was no evidence that the extent of the contamination in relation to the overall property rendered the site underutilized or vacant. As such, the municipality held the view the property was not a brownfield. The property owner disagrees with the opinion of the municipality as to why the property is vacant and underutilized. The municipality was preventing development of any portion of the property unless the property owner committed the time, effort, and money to perform the clean-up, conduct the SSRA, and file a RSC. Regardless of the extent of contamination at the property, significant money and time was spent to get the property to the point where the municipality would rescind the “Holding” Zone designation and allow the vacant, underutilized property to be developed. Is the property a brownfield? The local municipality says no. What say you? The United States Environmental Protection Agency (U.S. EPA) has just completed and published new toxicity criteria for benzo(a)pyrene – specifically an oral reference dose (RfD), an inhalation reference concentration (RfC), an oral slope factor (OSF), and an inhalation unit risk (IUR). Although toxicity criteria were considered for the dermal contact exposure pathway, the U.S. EPA concluded that the methods for dermal evaluation of benzo(a)pyrene required further development. Toxicity criteria form the basis of human health risk assessments and the calculation of screening levels and remediation goals. The U.S. EPA and state environmental regulatory agencies will use the new toxicity criteria to inform environmental risk management decisions on sites where benzo(a)pyrene is identified as a chemical of concern. Benzo(a)pyrene is often considered to be the most carcinogenic chemical within the polycyclic aromatic hydrocarbon (PAH) class of chemicals, and therefore often drives cleanup at PAH contaminated sites. PAHs are ubiquitous in the environment from natural sources (e.g., coal tars, shale oils, and crude oils, and forest fires) and as a result of anthropogenic activities, including the combustion of fossil fuels in industrial processes and automobiles. Workers may be exposed to benzo(a)pyrene in the production of aluminum, coke, graphite, and silicon carbide, and in the distillation of coal tar for consumer and medical products. Cigarette smoke and smoked or barbecued foods are major non-occupational sources of benzo(a)pyrene. Dermal exposure may occur through contact with materials containing soot, tar, or crude petroleum, including consumer and medical products containing coal tar, such as coal tar-based shampoos and treatments for skin conditions like eczema and psoriasis. Environmental exposures that are high enough to be a health concern may occur on sites where PAHs have been produced or released. There is no known commercial use for benzo(a)pyrene. How Might Screening Levels Change? Given the new toxicity criteria, the U.S. EPA’s Regional Screening Levels (RSLs) for benzo(a)pyrene will also change. RSLs for benzo(a)pyrene were generated, using the U.S. EPA’s on-line RSL calculator, for residential and composite worker receptors for soil, tap water, and air (Table 1). Based on this evaluation, all RSLs for benzo(a)pyrene will increase (i.e. become less stringent), except the composite worker screening level for air. With increased screening levels, benzo(a)pyrene will be less likely to trigger further investigation, mitigation, or remediation. Screening levels published by state regulatory agencies are also likely to change based on the new toxicity criteria for benzo(a)pyrene. Scott Dwyer is Practice Leader, Risk Analysis & Toxicology at Kleinfelder. Kleinfelder is a leading engineering, construction management, design and environmental professional services firm, providing solutions to meet our world’s most complex infrastructure challenges. Leveraging its integrated, cross-disciplinary team of nearly 2,000 professionals in 70 offices across the U.S., Canada, and Australia, Kleinfelder partners with private and public sector clients to deliver leading-edge solutions on a variety of large-scale projects. The firm’s reputation for expertise, innovation, and quality, earned since Kleinfelder’s inception in 1961, has solidified our position as a trusted consultant and industry leader. Market.biz recently released a research report on the Global Hazmat Suits Market – 2017. The report provides a comprehensive overview of the hazmat suits market including definitions, a wide range of applications, classifications and a complete industry chain structure. The report’s analysis further consists of competitive landscape of Hazmat Suits market, Hazmat Suits market development history and major development trends presented by Hazmat Suits market. As the report progresses further, it explains development plans and policies, manufacturing processes, cost structures of hazmat suits market as well as the leading players. It also focuses on the details like company profile, product images, supply chain relationship, import/export details, market statistics, upcoming development plans, Hazmat Suits Market gains, contact details, and consumption ratio. In addition to this, the Hazmat Suits Market report also covers gross margin by regions including the U.S., the European Union and China. Lastly, Hazmat Suits Market report includes an in-depth analysis of sub-segments, market dynamics, feasibility studies, key strategies used by leading players, market share study and growth prospects of the industry. The Hazmat Suits Report also evaluates the growth established by the market during the forecast period and research conclusions are offered. Record Year for Environmental Enforcement in the U.S. The U.S. Department of Justice’s Environment and Natural Resources Division recently released its environmental enforcement report for 2016. The report shows includes the highest recoveries in environmental enforcement and the highest criminal penalties handed down in an individual vessel pollution case. 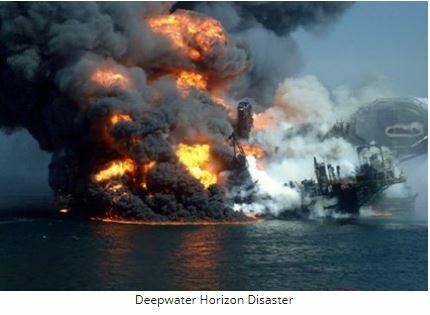 The year was highlighted by the completion of a settlement with BP arising out of the Deepwater Horizon oil spill into the Gulf of Mexico with the final entry in April 2016 of the consent decree in the Department’s settlement. This saw the United States and the five Gulf Coast states secure payments in excess of $20 billion to resolve their claims against BP. This settlement is the largest in the history of federal law enforcement for a single defendant, and it includes the largest-ever Clean Water Act civil penalty and the largest-ever recovery of damages for injuries to natural resources. In addition to the BP litigation, the division continued its program of prosecuting shipping companies and crew for the intentional discharges of pollutants from ocean-going vessels in U.S. waters. t the end of fiscal year 2016, criminal penalties imposed in these cases totaled more than $363 million in fines and more than 32 years of confinement. In December 2016, the division obtained the largest-ever criminal penalty involving deliberate vessel pollution when it concluded the prosecution of Princess Cruise Lines. The company pleaded guilty to seven felony charges and will pay a $40 million penalty. http://hazmatmag.com/wp-content/uploads/2017/07/Capture119.jpg 315 430 John Nicholson http://hazmatmag.com/wp-content/uploads/2017/01/hazmat-logo.jpg John Nicholson2017-02-16 03:05:422017-07-21 08:52:13Record Year for Environmental Enforcement in the U.S. 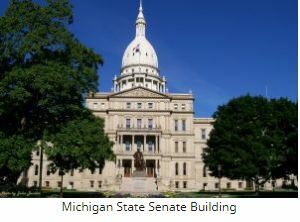 Legislators in Michigan recently re-introduced unique legislation in the State Senate meant to spur brownfield development in the state. If passed, the legislation would allow municipalities to choose one project per year to be eligible for a transformational brownfield. The transformation brownfield redevelopment would be eligible for tax relief on state income taxes. Under the proposed legislation, no taxpayer money would put at risk in the redevelopment of a brownfield site. Instead, the eligible developer of a brownfield site would be not pay state income tax or sales tax from construction activities on the site and also receive a discount of up to 50 percent of state income taxes generated from new jobs and residents for up to 20 years. Under the proposed legislation, a brownfield redevelopment project would need to be nominated by a municipality and approved by the State. Prior to the project being approved, the state would conduct financial analysis to validate the financial need of the company and ensure the gap does exist between what they can afford to build versus what they need to spend in order to clean up the contamination. Only the amount of money needed to fill the redevelopment gap will be approved for tax capture. The state will also conduct a fiscal impact analysis to determine if the project will have a net fiscal benefit to the state. Any proposed brownfield redevelopment project that would include $1.5 million or more annually captured in tax relief, would need to be reviewed by an independent third party. The legislation is being supported by a coalition of 40 municipalities and chambers throughout the state. The legislation is currently in committee. An earlier version of the legislation passed last time with bipartisan support, and that a coalition is working with lawmakers and members of the House committee to attempt to get it into law.